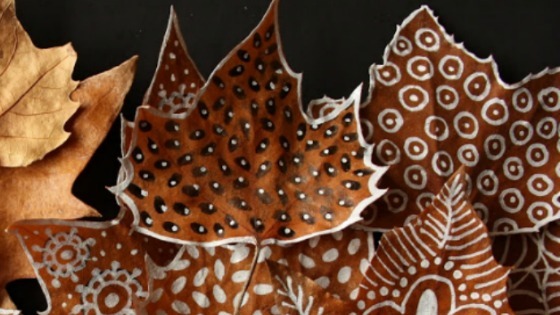 These painted leaves on the Bicocacolors blog of Madrid-based Elena Nuez are glorious. Her site is always full of intriguing, one-of-a-kind images, well worth a visit any day. I wonder as well how they are preserved, or even IF they are preserved. They are lovely! I wondered the same thing, but came to the supposition that they must be treated in some way to have the paint adhere so solidly. Thanks for sharing such delicate designs. I imagine this could be a conservator’s nightmare though. On another note, how to you find this On Demand template? Are you happy with it? I have been thinking of getting it too. That’s a great point about the “conservator’s nightmare.” Too true. I always look forward to your posts. These browns are gorgeous and the designs and textures- wonderful! I imagine it takes an accomplished hand to handle a project like this. One of my favorite finds recently. And thank you for your support! I really appreciate my followers. I’m always so amazed by the simple, elegant, creative projects that artists like this one dream up.